← You are allowed your opinion…& I am allowed mine. Heyoka Magazine…3rd part of the Looking Back Woman 2006 Interview…. Do you interpret this last line of what was translated to Wilbur’s mother (Chippewa), as meaning none of her people she knew were worthy..
LBW: I want to point out here, I did not say the “entire” Lakota race was unworthy, those are accusations and words of angry people–and are not my words–and will not be repeated again. Our Nation has suffered enough, lest we start to destroy ourselves, and play into the hands of those who would rather have the entire Lakota Nation not exist. We are speaking of historical data, and the concept worthiness and honesty amongst our Lakota Nation had deteriorated through continued systemic cultural abuse. This abuse as you know, as in all abuse cases–those abused begin to perpetrate the abuse they felt amongst their own relatives. The conditions on the reserves and the level of mistrust was epidemic, while at the same time people were trying desperately to survive in extreme conditions. JL: You said earlier on in the interview that you believe Andrew Dupree passed Martha’s Canunpa to Fools Crow. So several days after my experience in the home of Martha Bad warrior, Andrew (Dupree)and his wife came to me asking if they could use my car for the evening. This request I granted them immediately. I asked no questions, they offered no reason for the request. I trusted Andrew completely as he had proven himself trustworthy as a kinsman aught, Just as did the Larrabies, Elk heads, Iron Lightening, Fielder and others. I often thought of how often these friendships started. There was one explanation, it seemed: The part I played in running down information in family trees on the reservation and in supervising the distribution of food and clothing during the drought. It was late at night when Andrew and his wife brought back and awoke me on the arrival of it. They said they had gone to Martha Bad Warrior at her home in Green Grass. It was a meeting by appointment, they told me. Now, the surprise of a life time. They brought forth an object wrapped in a piece of calico striping. As they unraveled it, they were exposing tome the original sacred calf pipe. for it ha the exact makings described to me by Martha and the beautiful lady from the sun. I asked Andrew to fill me in with the details. Andre said to me than Martha placed the pipe in his hands, he and his wife went out together to a high hill near Marthas home and paid homage to God in prayer, saluting him in the four corners of the earth and universe and directing the pipe to the north, the east, the south and the west. Afterwards bowing in great reverence to the greatness of God, they turned and went to the car. From there they drove to where I was at the Cheyenne river agency. “Wilbur” said Andrew rest assured I will leave the pipe in the hands of a trusted one. He is an Indian and known by many as a true friend of the Indians. JL: Is this “trusted one” who you have interpreted as being Frank Fools Crow. If so, how did you come to this conclusion? LBW :I believe Andrew was speaking of Fools Crow. Fools Crow was recognized very young for his ceremonial abilities, he would’ve been 46 years old or so, when Andrew would’ve passed it to him, not a kid. He was at Turtle Mountain in the 1930-1940’s…. Fools Crow was 100 in 1989 when he died, he’d have been born about the time of the first Wounded Knee. 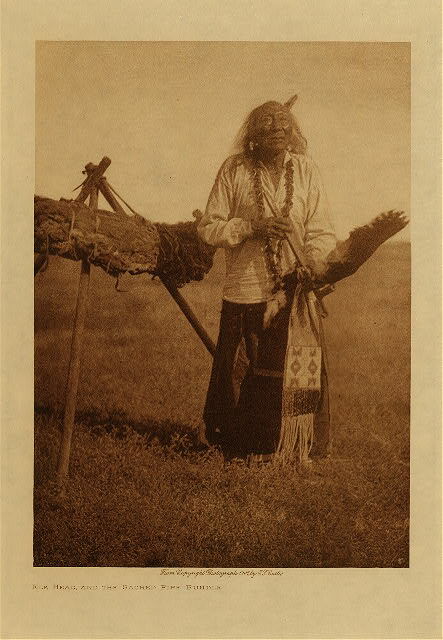 It makes sense it would go to the nephew of Nicolas Black Elk….when, at the same time Black Elk came out with the first book on Black Elk and the Sacred Pipe, and Seven Sacred Ceremonies/teachings. JL: When you said Fools Crow gave your father his ceremonial sun dance pipe because he had the proper vision. Do you see Fools Crow ceremonial sun dance pipe as a substitute for Martha’s pipe, since no one knows where that is? LBW: Yes, this is what I believe, and why I do, is to what lengths the Lakota went to, to do this series of ceremonies 1970-1975, despite the Freedom of Religion Act did not happen until 1978, which means…they, the Lakota participating, were in defiance of the Governments law outlawing the Lakota from conducting these ceremonies….the punishment to do so was harsh. And, what certain individuals have done to prevent people from actually seeing women participating in these ceremonies with the men, since we’ve posted the photos on my site. Two important things were done in 1971, during these ceremonies. The passing of Fools Crow’s Sun Dance Cannunpa to my Father, and the passing of the “Staff” of power back to the women. The fact that in 1994 when my Father died, Lakota Traditionals went into his coffin looking for this Cannunpa Wakan, after his funeral at the Dupris cemetery. No one has come forward with who did this. My Lakota cousin, Lisa told me in 2000, that they were looking for this Cannunpa Wakan. Chief Frank Fools Crow was the Ceremonial Chief of our Nation until his passing. He had many Canupas in his possession. What is most important is the relationship between the Ceremonial Chief and the Keeper of the “Sacred Canupa”. When the Ceremonial Chief was called upon to perform Ceremony for the Nation – such as the annual Sundance and WBCPW – Canupa Ceremony – he would call for the “Sacred Canupa” – not the original Canupa from White Buffalo Calf Pipe Woman (it had deteriorated many years ago) – but the Sacred Buffalo Canupa that was to always sit with the original Sacred Canupa. The very first Canupa Wakan – has long since gone and quite understandably could not be used for the special annual Nationwide Lakota ceremonies. The Buffalo Canupa that was passed from Chief Fools Crow to my father, was the very Canupa that was to only be used for Ceremony for the Nation by the Cermonial Chief and is not to be interpreted as Chief Fool’s Crows personal Sundance Canupa. Remember what I said above – his personal Canupa was very distinctive and different from the Standing Buffalo Canupa. I am familiar with this Canupa and design – and due to privacy and respect to whom it was passed and for their own safety I will not describe Chief Fools Crows personal Canupa; besides that is not the issue nor anyone else’s business — at this time. What is very important is understanding why in the early 1970’s did Chief Fool’s Crow allow – photo documentation of this Sundance and WBCPW – Canupa ceremony, particularly why was the focus of these photos on Calvin Dupree – my father and the Sacred Buffalo Canupa. In addition to this I would also like to add that this Buffalo Canupa appears in other photos that concerned the entire Lakota Nation. One of the Sacred Seven Ceremonies that our Lakota Nation performed more than all the other ceremonies is the Inipi – or Sweat Lodge Ceremony. During this ceremony the Canupa is utilized inside the Sacred Lodge. The humidity and heat take their toll on the Sacred instruments that our Medicine people use. Many Medicine people have more than one stem for each Canupa and some Medicine people have more than one Canupa bowl. Many of the stems are very ornate and decorated with Sacred symbols, quill work and beaded symbols that identify – Clans, families, locations and other spiritual messages significant to the user and the Lakota Nation. Many of the Canupa Bundles or Pipe Bags – have symbols and meanings that identify – the person carrying the Canupa, their spirit name, their home location and their clan.The response to this continued wear and tear is a very common sense approach. Many Medicine people have a Canupa that is for sharing during special Canupa ceremonies and is kept specifically for these special events. Lakota and other Native Medicine people have a personal Canupa, which is for personal or family use only. They may have a Canupa that they use only in the Inipi, another for their Sundance and even another for Ceremony within community. Our elders instruct us to bring out our Canupa’s at least seven times a years to honor our Nation and the Sacred Red Road. The “basic concept” is that when a Medicine person – who walks the “Good Red Road” – has gained the respect and honor of their Nation and the elders who instructed them in the Sacred teachings; they attend to their needs as they see fit — in regards to their personal Medicine instruments. What this means is that each Medicine person chooses what suits them according to what demands are made upon them during Sacred ceremony and the “Position” they hold within our Nation. Chief Frank Fools Crow was the Ceremonial Chief of the Lakota Nation at the time the Religious Rights and Freedom Act finally permitted our Nation to conduct our ceremonies in the “open”. Not only was this one of the most important and joyous days for our Nation it was especially important for our Nation to see the Canupa Wakan – the Standing Buffalo Canupa that was supposed to have been in the care of the “Keeper” was in the hands of the Ceremonial Chief of our Nation where it belonged and EQUALLY IMPORTANT – IT WAS PASSED TO A FAMILY THAT HAS PROTECTED IT EVER SINCE. This is the Sacred Canupa that was passed to me by my father on his death bed. When you ask me about Martha Bad Warrior, and the lineage of the Sacred Canupa you are asking me to also speak for those who are hiding the truth about what happened since the days of Martha Bad Warrior. Traditionally trained Medicine people avoid speaking poorly of others in their own Nation and at the same time make no excuses for them and the way in which they walk in their lives – especially upon the Sacred Red Road. Why has the Sacred Bundle not being used for Lakota Nationwide Ceremony and not been opened in modern time? Why is the Standing Buffalo Canupa – the one I carry passed to me by my father on his death bead – and the last one USED BY CHIEF FOOLS CROW – not been seen since 1971 at the annual WBCPW – Canupa Ceremony and Annual Sundance? Please also consider in my reply to this entire issue of this Sacred Canupa the true essence of our Lakota nation and our meaning of Mitakuaye Oyasin. We are related to all that is, all that was and all that is to come. What was done by our elders and Medicine people was in response to the direction given them through the Spirits, our ancestors, oral teachings and what direction they see in their lives as they walked in “service to their Nation”. It is not our place to question the direction given by our elders and the” Holy Men and Women” of our Nation. What was given me was a name that reveals not only my human name but my “Spirit Path upon the Good Red Road”. This name has been passed through the years and carried by other women before me and speaks to my reason and purpose and direction in my life. What was ALSO given me were Sacred Bundles and a means to protect them until the time came to Look Back and raise this Sacred Bundle in prayer for our entire nation. The true issue is that I am amidst a Sacred Sharing with you. I am “Looking Back Woman” and this name speaks to my Spirit Path and walk upon Mother Earth on this “Good Red Road.” What the Creator has placed in my care is not something any person can judge or question knowing how this came to pass and what is happening within and without our Lakota Nation. What has been passed to my family and is now in my keeping was done for a reason that is beyond us all. What I am saying here is the controversy stops here and now. Should any person continue to attack my family, speak poorly of what was witnessed and properly passed to my family – they will disgrace themselves, AND our elders in their wisdom and direction. The Scared Canupa and all Canupas held by our Lakota nation are for the health and healing of our people. The Sacred Standing Buffalo Canupa that is in the keeping of my family calls for prayer from all Canupas within and without our Nation. This Sacred Bundle is also speaking to the heart of our teachings and directions GIVEN by our elders, and Medicine People, to unite the Hoop not Break it. There are “Broken Arrows” in our nation and this Sacred Bundle is moving towards the balance that is required and the cleansing that is about to occur. This Sacred Bundle is calling for all Lakota people to be pure of heart and have courage to not divide our nation and serve those who would prefer our Lakota Nation never existed. “Hey friend what I say here is the truth – because I say it is so. ” – are words roughly translated from one of our songs. They are said while holding our Canupa in prayer and to do otherwise would disgrace, all that is Sacred to our Nation, our elders teachings and direction given. I pray you and those that read these words understand the Bundle is in my Keeping and as a woman – I am speaking to my nation and all our allies. Please hold our Lakota Nation in prayer and help us during these difficult times. JL: Is there a distinction between a Canupa wakan, or a ceremonial sun dance pipe or the WBCP? LBW: This is a very important point and one that has been turned against my words repeatedly. I will try and clear these distinctions up for you. All Canupas that have been brought forward in vision, lineage or descendency in our Native cultures – for use on the Red Road are here to serve our Relations in finding health (body -mind and spirit) and help – are ALL SACRED. The Canupa is both a living spiritual instrument and symbol; and like all symbols they transcend time and cultural changes. A Pipe is just a rock and a piece of wood. What makes it a “Canupa” or Sacred is the manner in which it serves the purpose and vision of the original White Buffalo Calf Pipe Woman’s directions to our Lakota Nation, and how the person who holds it conducts them self in the everyday life. The Red Road and the Canupa are not for Sunday worshipers. It is a lifetime commitment where you give your life to serve your people and you do not put it down because times get tough, or pick one up because want to be a Hollywood Indian in Disney Land. The problem with the Original Canupa Wakan – or the First Canupa received from White Buffalo Calf Pipe Woman – is that it has wasted away with time. There is even talk that some of the holy men and women of our Nation have small pieces of the original Buffalo Bone . What is known – that for many years the Sacred Canupa Wakan – or First Canupa from White Buffalo Calf Pipe Woman – has not been seen or used for many decades because it simply was non-functional as a Canupa. It had deteriorated so badly only fragments of the original Canupa remain. (This is a very similar parallel to the Christians and their Cross of Christ – there are pieces of it all over the world in many Sacred places – but does the original Cross of Christ exist – no it does not). Due to the condition of the First Canupa, it was undertaken many years ago by the Elders and Medicine people (women and men)- to have a Ceremonial Canupa – one that could be brought out each year at the White Buffalo Calf Pipe Ceremony and Sundance. This Canupa was to be used by the Ceremonial Chief of the 7 Lakota Nations. The Ceremonial Chief was not an inherited title, or a descendency – it was a title EARNED THROUGH SERVICE and held by a person whose every waking moment was dedicated to the Red Road and serving All our Relations- and most importantly – a person who HAD NO BLOOD ON THEIR HANDS. The person who held this Canupa Wakan to the Four Directions to call the Ancestors, was a person all the Nation knew to be a “true holy medicine person” – a position in our culture that comes from the manner in which these people carried themselves and the Sacred teachings of our Ancestors. JL: Do you see your self in-line with the keepers of the Canupa Wakan like Standing Hollow Horn, Two Runs, Bad warrior, Elk head and Martha Bad Warrior? LBW: What makes a person worthy is how they carry the four original gifts given all human beings – Courage – Generosity, Compassion and Humility. These gifts are then witnessed by the elders and the people of your Clan and Tribe amongst our Nation. The elders see the children that give to others before they take for themselves, they see those that show compassion, to those who attack and hurt them – they see the willingness to put their life on the line for – the weak, innocent, the children and elders. These people were also the first to stand against our enemies – their only weapon was their truth and the Sacred Canupa Wakan they held across their heart for our Nation. When a person looks at themselves and thinks they are worthy, it is because they are speaking from an egocentric point of view. People who walk the Red Road and carry a pipe in this manner – abuse others and our Sacred Ceremonies and are more inclined to be individuals or groups whose motives are guided by financial, personal gain and Spiritual Materialism, rather than service and truth for our Nation. JL: When you came in possession of this Canupa. Did you also have a vision at that time? LBW: Once again you have asked a question that speaks of the Sacred or Wakan – to our people. A Vision cannot be spoken of until it comes into this world or “alive” and is received from the “Spirits”. The details of the Visions that I carry cannot be spoken off until certain events occur within our Nation. I have spoken before of my vision to see the Hoop of Life repaired for ours and All nations, but this is a Vision from our elders and given us as a direction in our lives. I will speak to one of my visions and direction given by Spirit, that I now see others repeating – which refers to the “call to prayer” for the Seven Council Fires. I see all our Lakota /Nakota /Dakota relatives coming to Turtle Mountain to a Sacred Council site and I see the Standing Buffalo Canupa being opened and offered to all those worthy WOMEN and MEN that come to represent each of the Seven Nations of our Peoples. In this vision I see both WOMEN AND MEN holding their Canupas and our prayers united, and the Standing Buffalo Canupa will be offered to this Council to mark the time of cleansing and unity for all out relations. JL: Have you used this Canupa in ceremony or have you used it for personal purpose? LBW: This is a deeply private question that is not for discussion as the use and reason for using a Canupa are very private and between our Relatives and the Spirits we speak to. Please understand the Sacred Canupa has been called for and used and is in my family’s “Keeping ” to serve our Nation. I have my own personal Canupa which I use each day as instructed by my elders. The Sacred Buffalo Canupa has been and will continue to be used and will response to all worthy and respectful requests. JL: Do you see a problem with the fact you live in Canada and not in South Dakota where the Lakota people live and practice most of their ceremonies etc? LBW: The Border that exists today did not when our Nation roamed the grasslands and what is very important is the understanding of what Turtle Island and Turtle Mountain mean to this question. The place called Turtle Mountain is the geometric and geographical center of North America – Turtle Island. So no I do not see a problem with where I live. What is very important is that I am NOT living within my Nation. I am a Woman standing in a place that the men of my Nation, who call themselves wakan and created “the protection of ceremonies proclamation” — would not permit me to be who I am. They would say I am not allowed to do what I am doing and they would try to disgrace and destroy what is Sacred to our people by attacking me. I am a Woman whose father’s burial site was desecrated in the search for these Bundles – I am a Woman who sent a magnificent horse home to our Nation as a gift to carry the Spirit of my father – to run free – and it was MURDERED, while in the care of my relatives who reside outside Eagle Butte. I am a woman who does not live in our lands, and while I was trying to help my people with lodging, in my 17 year old innocence- was violated by the very men who claim to be Sacred and carry us toward this blueprint of Christian fundamentalism by: setting out twelve wakan men, dismissing women from all levels of Ceremony and Sacred Council, and calling for the very government that attacks us to regulate our Sacred Ceremonies. I am a Woman given these Sacred Bundles to carry for our Nation and I am a Woman alive today because I do not live on our Nations Lands. JL: When you said earlier about wanting to use your Canupa to unite the 7 council stones and the seven fires. Have you been preparing for this? LBW: Yes I have been planning and preparing for this over the past four years with my contacts in Manitoba and other relatives. I am the person who raised this Vision to life of the SEVEN Council Fires and the Sacred Stones that go with this Sacred Council and I am making arrangements for a ceremony this year. It is during this ceremony that the Sacred Standing Buffalo Canupa will be opened to those worthy to represent their respective nation within our Lakota people. I will also state very clearly no person with blood on their hands will enter this Sacred Council, nor ever touch the Sacred Canupa Wakan – AND THAT IS WHY THE BUNDLE AND I ARE NOT AT HOME at Cheyenne River, and are under the Blanket of protection of warrior Societies here on the northwest coast of Turtle Island. There are “Broken Arrows” in our Nation at this time – that have entered the very heart of our Lakota People – this is the time to heal and help our Lakota Nation and all HER people. It is the time to REMEMBER ALL THESE TEACHINGS CAME FROM A WOMAN – or has everyone forgotten this?JL: What do you see is the logic and reasoning for the Lakota spiritual ceremonies needing regulation by the US government and not by your own people? LBW: I see no logic in it at all. We have had the rights to practice our Ceremonies reinstated over 35 years ago. That was just about the very time that these Hollywood Indians starting looking for their own Disney land and using their Canupas like brooms sticks flying off all over the place – but especially at the mouth. Now look where they are – inviting someone to regulate our ceremonies again. Does this appear to be very disturbing to you? I know it makes my skin crawl that these men think they can tell a woman how to be spiritually. This insults the very origin of our nation and of all nations of the entire world – women are the source of life. It reminds me of the stories of our people being told to not speak our language or have their tongue cut. If you want to see my point – see how it feels in your heart if you even try to insult your own mother! Can you feel that? Well imagine if you were that mother, or any woman. The Creator’s endless dance of creation and destruction are paired like two spirals of energies flowing in opposite directions. The weave they make through the fabric of our reality, reveals hidden and deep understandings of our universe in the unity of opposites. When this unity fails as in the imbalance of men and women in this world – destruction can dominate until all is in ruins – and the cycle of Creation begins again. We have done this before – and now is the time to restore Balance. I truly appreciate your efforts to open these issues honestly and respectfully to the world. If it was easy to walk the Good Red Road – it would be paved by now or called – the yellow brick road. Well this is not the land of OZ and I am not the “wicked witch of the west.” I am one woman saying she has had enough of this violence and I am making this “call” to restore balance to our Nation as the process of cleansing begins. I am one Woman walking with these Sacred Bundles and the “holy smoke ” they release in prayer carries my words on my breath and from my heart. Please remember the joyful sounds of our children’s future begins in the drum beat of our mothers’ hearts. 1 Response to Heyoka Magazine…3rd part of the Looking Back Woman 2006 Interview….